Montgomery Home . . .
We only had about 190 miles to go this morning so we took our time and didn’t leave the park until about 10am. Out on I-10 in just a few minutes, we turned north on i-65 a few minutes later. Then it was pretty much just a straight run until we got off a little north of downtown Montgomery, and pulled into the Capitol City RV Park about 2pm. We stayed here during our last visit in 2010, and it ‘s a nice park to come back to. This was a very nice trip, very smooth, with no problems, traffic or rig. The generator and the AC’s kept us nice and cool again, so I think my AC airflow problem is solved. A little before 4pm we headed over to the home of our long-time friends Fred and Susan Springall. Fred and I worked together in the mid-70’s when we were both with Storer Cable, which later became TCI, which later became 3 or 4 other companies along the way. 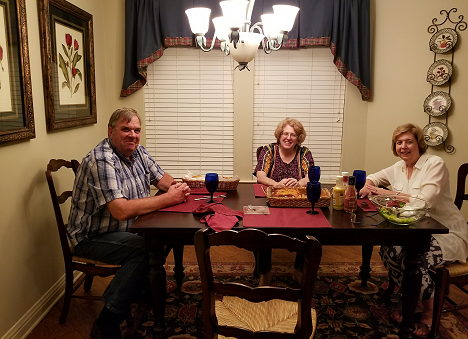 Susan fixed us a delicious dinner of lasagna, and salad, and home-made pound cake with fresh strawberries and ice cream. Really good. The last time we visited with Fred and Susan was in 2010, and as Jan remarked on on the way home, it was like we had just seen them last week. We all just sat down and started talking, seeming to pick up right where we left off last time. We lived here in Montgomery for about 4 years before we moved to Houston, buying our first home while we were here. So tomorrow we want to drive around a bit, and check out some old haunts. Then tomorrow afternoon we meeting up with one of Jan’s former hospital coworkers who lives up in Prattville, a little north of Montgomery.